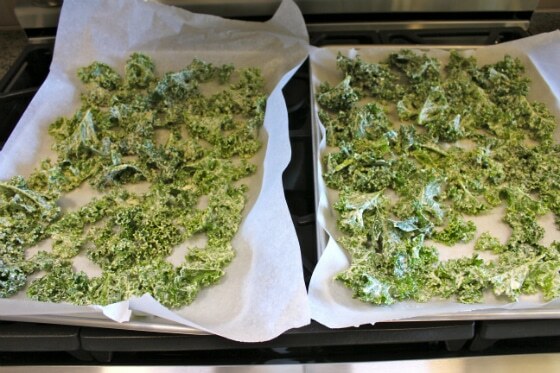 Have you tried making homemade kale chips in the oven? 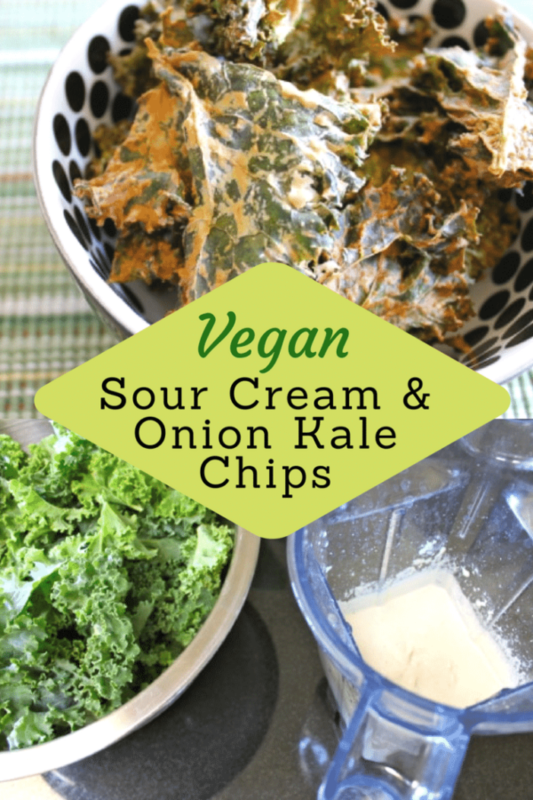 This Vegan Sour Cream & Onion kale chip recipe is worth the effort! Mmmmm, they were SO GOOD! Now I understand what all the fuss is about with kale chips. 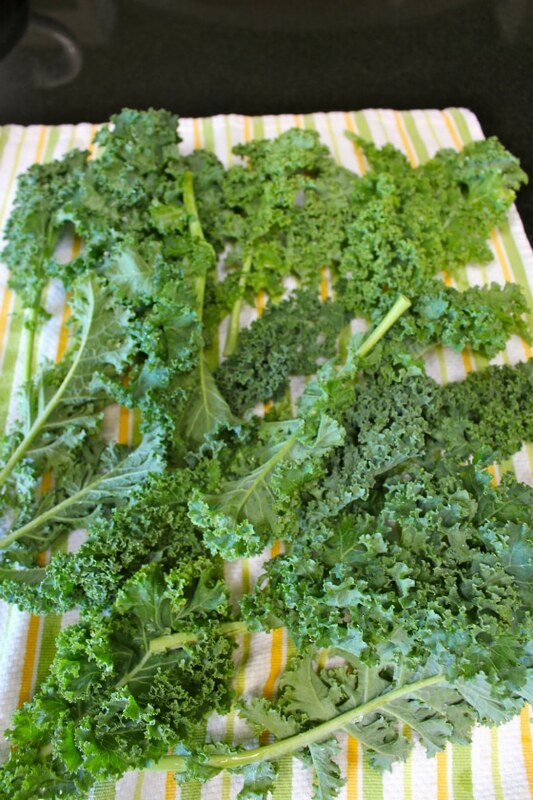 Wash and dry kale leaves thoroughly. 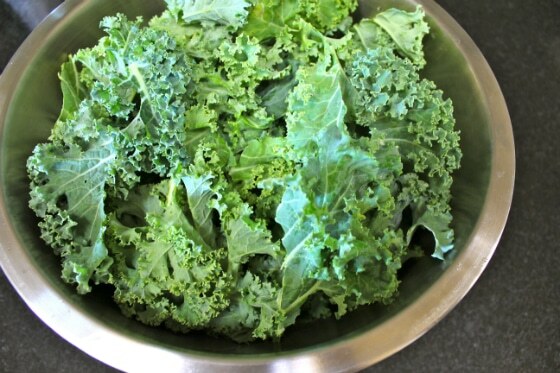 Pull off kale leaves from stalks in chip-sized pieces and put into large bowl. Combine the cashews and soaking water, onion powder, garlic powder, vinegar, salt and parsley in a blender and whirl until smooth. 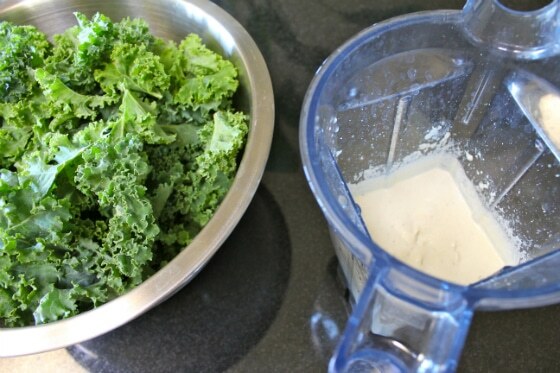 Pour mixture over kale leaves and use hands to distribute cream over all of the leaves. Lay out leaves on two parchment paper-lined baking sheets and bake for 60-70 minutes or until crispy. 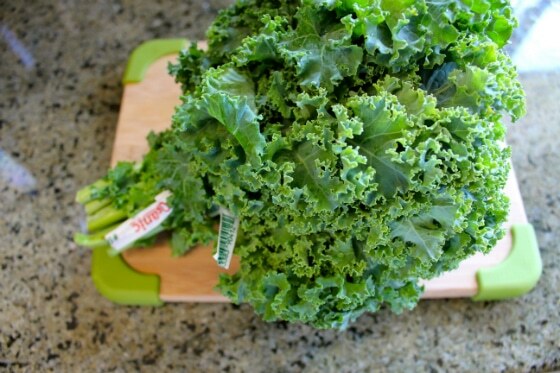 It looks and sounds really good, maybe a good way to try kale :). It’s funny, I just put The Thrive Diet on my books-wishlist, now I’m even more excited to read something from Mr. Brazier. Thanks Sara! I think his books are worth checking out, I’ve read two of them now. Let me know if/when you try kale! I love kale, but I have never done the chips. I’ve never thought they looked flavorful enough, but this changes that! They are really great and taste a lot more like potato chips than veggie chips! Let me know if you try making them and how they turn out. They turned out great – although I would have add more of the sauce to each leaf next time. 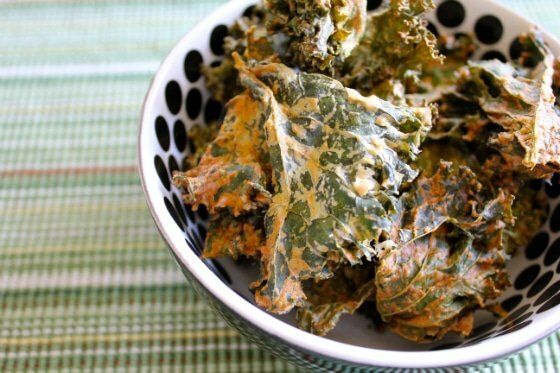 Great reviews from our veg-curious friends who had never had Kale Chips before. Yum! This looks so good, Carrie! I’ve been lagging behind the kale chip revolution, but I hope to get on the bandwagon with this recipe! I think I’ll try substituting sunflower seeds for the cashews to see what happens (nut allergy in our house). Thank you! Hi Cynthia, thanks for the comment! Can you substitute sunflower seeds for cashews in most recipes? Do the sunflower seeds get a creamy texture like nuts? I’m so curious! 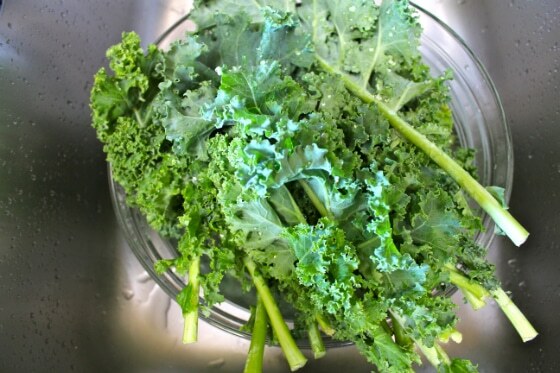 A great use for those leftover kale stems is to chop them and Vitamix them with some bottled carrot juice. This makes a wonderful soup base. Hi Darryl, great idea for the soup base, thank you!!! I’ve gotten pretty addicted to kale chips, but I haven’t had this flavor before. I’ll definitely be making these soon. Happy MoFo! I have not tasted kale chips, but these look great. I have kind of an aversion to using my blender (mostly because I hate having to clean it afterward), but I definitely need to get myself to use my blender so I can make these! Hi Rachel! Isn’t cleaning up the worst part of cooking? I make my husband do it. 🙂 When I used a blender I used to put it in the dishwasher to clean. Now that I use a Vita-Mix it’s even easier, you just add soap and whirl it for 30 seconds and then rinse it out. Good luck! Thanks Glauce, looking forward to checking out your blog! Vegan Mofo is so much fun! Thanks for the comment! Yeah, I forgot to say in the recipe that the chips can burn easily. So glad you liked them! 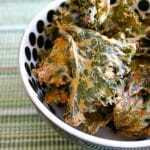 Hi Christine, this recipe is really worth checking out, I was amazed by how satisfying and delicious the kale chips are. Just remember to follow the directions carefully because I’ve messed up a few batches by either cooking them too long or leaving out a key ingredient. Good luck and let me know how they turn out! These look great. I’m recently addicted to kale chips. I just made a quite tasty batch of nacho kale chips with both “dinosaur” kale and curly kale using this recipe: http://www.veganculinarycrusade.com/2011/03/nacho-kale-chips.html The only change: I used some dried peppers that I grew instead of the cayenne. I tried these for my heart healthy Valentines Day, however, they did not turn out looking like yours. I know I made my pieces too small. But I wonder why my cashews didn’t cream as well as your pictures? The flavor was wonderful. Hi Joanne, did you use a high-speed blender like a Vitamix to blend the nuts? A regular blender will not get nuts to turn creamy. Hi Carrie – thanks so much for this recipe! I’ve been wanting to try kale chips for some time and hope to experiment soon. One thing to mention: a salad spinner will make the process so much easier and they are inexpensive. They have a colander that fits inside another bowl so you can rinse your greens efficiently. Then just spin them dry! Great recipe. I want to get the book soon. Since I don’t have a vitamix I get a much creamer cashew cream if I blend the nuts first before adding the liquid. Still not as good as the Blendtec or Vitamix. Hello Carrie! I’m new to the vegan lifestyle, i just found your blog and it hugely inspiring! these look amazing so I wanted to try them. How long do you soak the cashews? I’m so glad I made a double batch of these yummy chips! They are awesome. First thing my hubby said was, “These are so much better than Trader Joe’s.” Much cheaper, too! I’ll be making these next week for company. Just a note: I used curly kale which is kinda “fluffy” so I had to skip a slot between my dehydrator sheets. A double batch just fit into my 9 slot Excalibur. Thanks again, Carrie, for another FANTASTIC healthy recipe! Hey Carrie…the chips are in the oven…first try…once they are done, how do you store them to keep them crisp? Hi Lisa! I just put them in a ziplock bag or closed glass container. thanks Carrie! that seemed to work and they are delicous!! I love sour cream & onion chips too!